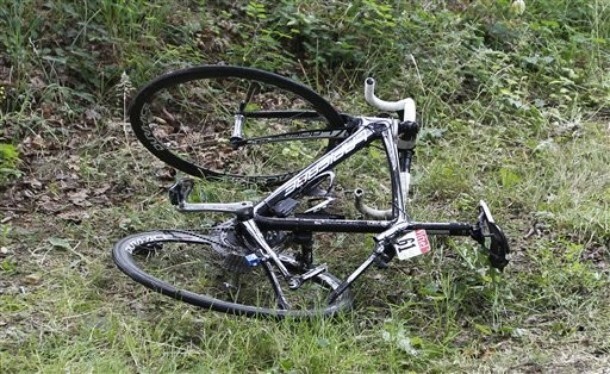 Frank Steele wrapped up yesterday’s chaotic stage well on the TDF Blog and it was a worst-case scenario: wet, narrow, slippery roads with oil from a crashed motorcycle. Behind, the descent of the Col de Stockeu looked like the train station scene of “Gone with the Wind,” with riders all over the roadside. Some reporters estimated 70-80 riders went down, and there were reports of soigneurs climbing out of cars to help their riders, then falling down themselves. Some riders (and Eddy Merckx) have suggested there must have been some sort of oil on the road (leading to my favorite tweet of the day), because the road seemed so much more treacherous than when it’s been raced in LBL in the past. I’ve crashed with a whole peloton before and it is surreal. Our Tuesday Worlds is ran on a car race course with a drag strip. They use detergent to soften the dragster tires for grip at 200 MPH and over the years, a layer of polished rubber has been laid down. Add water to that polished surface and it turns into a well-lubricated skating rink. They’re hurting out there today and also worried. 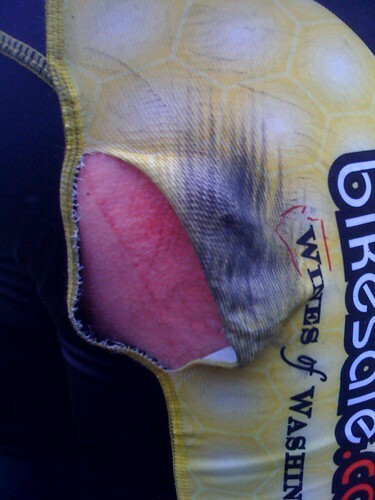 Regarding CVV, who seems to crash out of a Grand tour every season, I’ve broken ribs too and that really hurts.